The new reboot of Prey has a lot of people excited. Bethesda Softworks is publishing the game, and hosted a pre-launch event at the Regent Theater in Downtown Los Angeles. This included, of all things, a screening of The Matrix. We were on-location and able to get our hands on the game one last time before it’s unleashed onto the world, and have one more preview ready for your reading pleasure before its release this coming Friday, May 5, 2017. There’s not much about Prey that feels like a standard shooter. This extends to the main weapon, the GLOO cannon. We’ve seen it from earlier time spent with the game, and here you use the gun to slow down enemies, block busted pipes which are spewing flames or other hazards, or to create platforms in order to reach higher ground. Arkane Studios is known for making games with verticality. Prey feels as though it sticks to a lot of the same design paradigms from their other series, but with a sci-fi twist. There’s some similarity to be found in that you;re shuffling between using powers and traditional weapons, but Prey definitely has its own unique personality. For starters, you’re in a massive space station and are free to move about as you please. The station has become overwhelmed with various alien species collectively known as the Typhon. Playing as the amnesiac Morgan Yu, your main goal is to piece together what happened to you, and perhaps uncover if something larger is being planned by the TranStar Corporation. During a quick Q&A session with Arkane Studios, they dove into some fairly low-level decisions about the game. For instance, although you can temporarily stop enemies with the GLOO cannon, you cannot melee them with it. Instead, you must switch to your trusty wrench if you wish to melee. This was done for both practical and design decisions. At a practical level, Arkane Studios was simply out of buttons to dedicate one to melee. Indeed, R3 is used to bring up the Psychoscope, a utility that allows you to scan objects to gather intel and even unlock abilities after scanning enemies. Arkane Studios also decided that allowing melee with any weapon would negate the use of the wrench, so disabling melee on other weapons made sense from that context. Speaking of the Psychoscope, we were able to play around with it during the demo on display at the event. This device is placed on the player’s head, and can be used during combat. As enemies approach you, you may attempt to scan them in order to learn information about them. While this can include statistics and even weaknesses, scanning enemies will most importantly unlock some of their abilities. Using the same neuromods that unlock the previously-seen Psi abilities, you can build up alien abilities by using the Psychoscope in this manner. Towards the end of our demo, a particularly tough enemy had to be induced in order to proceed. A straight-on assault always resulted in defeat, since I was low on lethal ammunition. After a couple of failed attempts, I took it upon myself to try something different. So after scanning the enemy with my Psychoscope, I slowed it down with my GLOO cannon and unloaded a single magazine of my pistol. Once the GLOO started to wear off, I bolted for a pair of elevators at the entrance to the room. Once I was in the level below, I watched as the blip indicating where the enemy was moving to, and sure enough, it was following my path. I waited hesitatingly close to the elevator, and unloaded another clip of ammo into the alien, then quickly took the “up” elevator. The alien followed me again, but by this point I was very low on ammo and opted to head into the “down” elevator one more time. I ran down a hallway, and happened upon a turret that was in need of repairs. Using the spare parts I had on hand, I managed to repair and deploy the turret, just in time for the alien to come sauntering down the hall, where it was successfully dispatched by the newly-restored turret. It’s this kind of open-endedness that Arkane Studios hopes will keep things fresh, and I was impressed that I could improvise so easily. Prey is a strictly single-player affair. While the ability to possess/mimic any item in the game might have presented some interesting multiplayer options, ultimately Arkane Studios decided to devote all of their resources to crafting the best solo experience they possibly could. It’s reassuring to see a developer stick to their guns and know exactly what they want to do with a game, and hopefully this laser-like focus on single player equates to success. 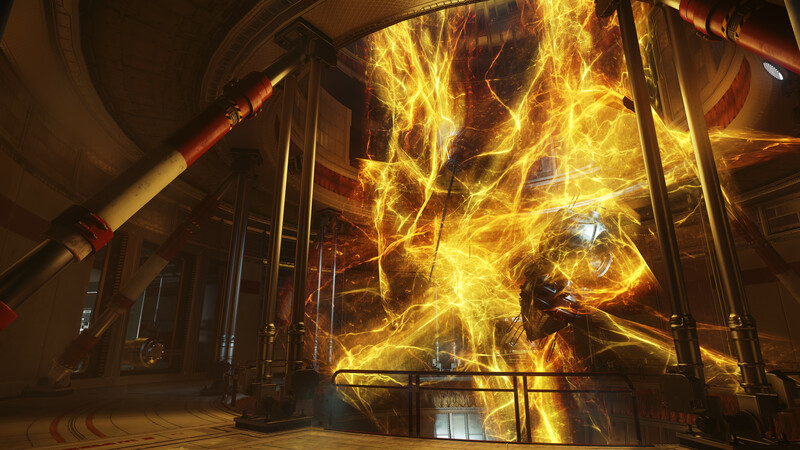 Based on what we’ve seen with our handful of hours spent with the game, Prey is shaping up to be a great game for those who love open-world first person shooters. With a wide mix of powers and weapons at your disposal, the various ways in which you can dispatch enemies may never get boring. Prey releases on May 5t, 2017, and rest assured our verdict will be rendered in full with a review coming shortly.